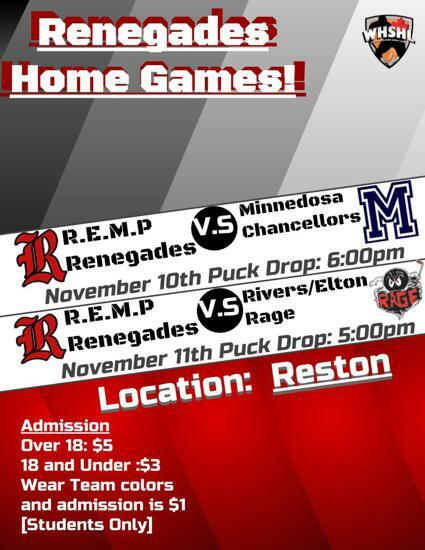 Busy Weekend For The Renegades. 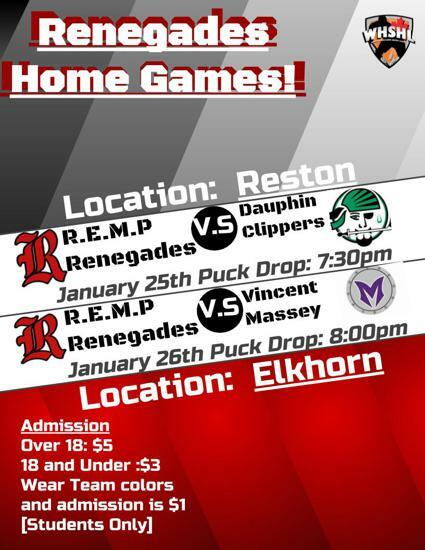 The Renegades had a busy weekend with The Dauphin Clippers coming to Reston on Friday and the Vincent Massey Vikings rolling into Elkhorn on Saturday. The boys held off the Clippes for as long as they could. Billy Patmore with an outstanding game gave the renegades a chance as it was 0-1 going into the third. A couple bouncing pucks and a late push by the Clippers lead to a 0-4 loss. Saturday was our turn to fire up the offense and finally score some goals. A game full of hits, chirps and goals led to an 8-2 Renegades win over Vincent Massey. The Renegades pull of an 8-5 win over the Souris Sabres in an exciting game at home. 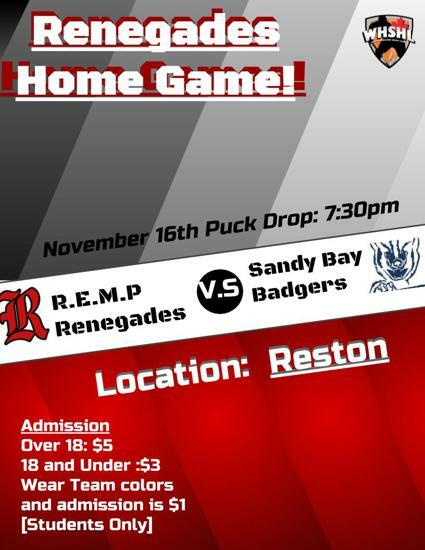 The Renegades lost a tough one to Sandy Bay last night. There was some good hockey played in the first period, but Sandy Bay came alive in the second. A quick few goals by Sandy Bay shocked the Renegades and the boys couldn't pull off the win. Tied 1-1 after 1 with Sandy Bay. Liam Vercaigne with the goal. Boys take down Roblin 6-5. Chase Tilbury led the way lighting the lamp twice with 1 helper. Soder, D. Shiner, Chant and C. Murr with solo’s.